There are very few children I have come across which do not like bouncing. Bouncing on your bed, the couch, on a trampoline, through puddles, into the pool, and pretty much any where you can think of. I am sure you can agree with me, you've done it too! I also know most children love the water, especially during the summer. 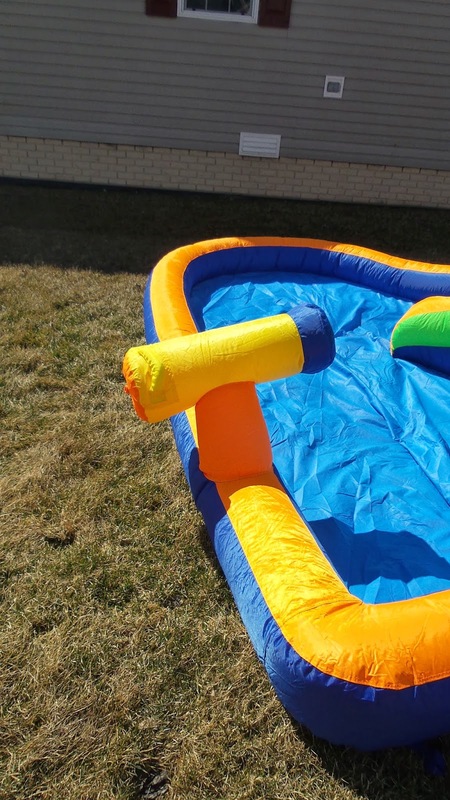 Of course being in the pool is great but even beaches, lakes, splash pads, and toys like slip-n-slides or sprinkler's become irresistible to most! It could be just the people I have surrounded myself with but for the most part I feel like even the ones who are scared initially usually warm up to these fun ideas and activities pretty quickly. This especially tends to happen in our home since we are a house full of swimmers and lifeguards plus with the boys now a bit older, they can challenge any one into becoming a daredevil! 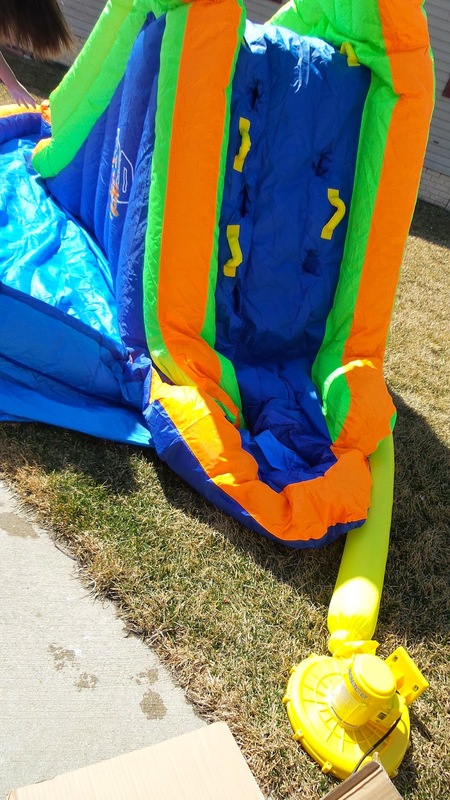 Knowing that we didn't have a pool in the backyard (and weren't planning on it in the near future), I decided this would be part of my criteria for the new structure. 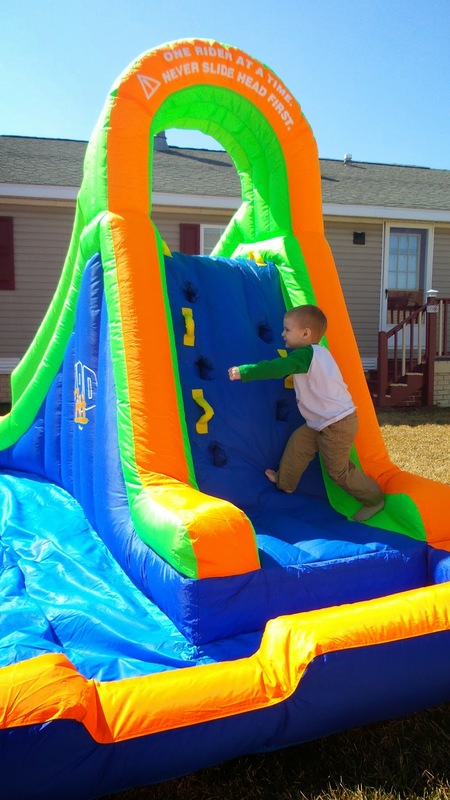 I also know that because we live in Michigan and the weather is about as unpredictable as anything, that any of the bounce houses we purchase will need to be easy to setup and breakdown. Blast Zone products right away caught my eye when I noticed they claim to use "9x stronger than average materials". They use as few seams as possible which had me even more interested since the boys have busted many of their pool float seems just being normal boys. 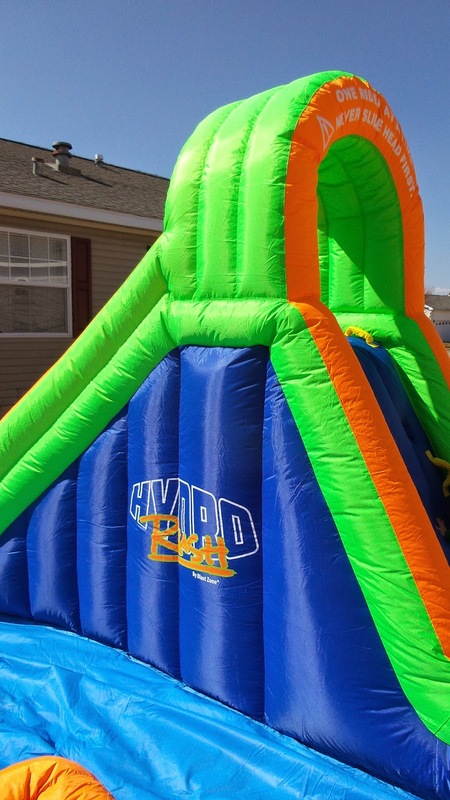 They also use an X-Weave material so when my crazy children attempt crazy jumps and flips, I won't have to worry about the inflatable bursting. I love hearing that each and every inflatable is inspected a minimum of 7 times throughout production and on the slight chance something slips through the cracks, they have a 90 day warranty. 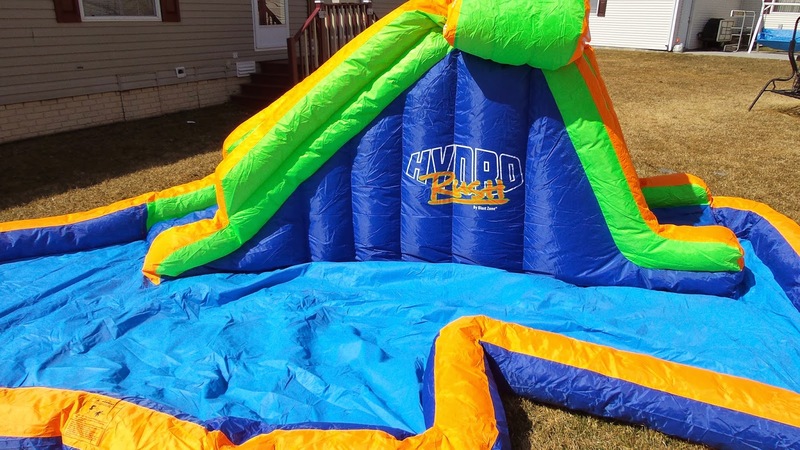 Finally, the quality that gave me the most confidence that Blast Zone was the company for me, was reading that the "water inflatables have built-in water flow restriction." keeping them as utility efficient as possible! I love the fact that this literally takes seconds to put up and even only a few moments to break down quickly (once you've done it a few times). Now I do have to admit, because I am not a direction reader, I of course went to set it up and couldn't figure out for the life of me why the first time took so long to blow up. That was of course until I opened the instructions. Then, I quickly realized I had to tie up a part I was missing where all the air was releasing from! The kids were super excited to use this the minute it arrived and in fact it killed them waiting on our crazy Michigan weather while this sat in a box for over a week. Of course Declan was the first one to test all the different possible ways he could go down (or bounce down) the slide! We are now looking forward to warm enough weather so they can use the pool portion and sprayer to blast each other!! DISCOUNT: Blast Zone even posts coupons and discounts from time to time! Recommendation: I think this is beyond reasonable cost as most companies seem to be much higher pricing for something so large. 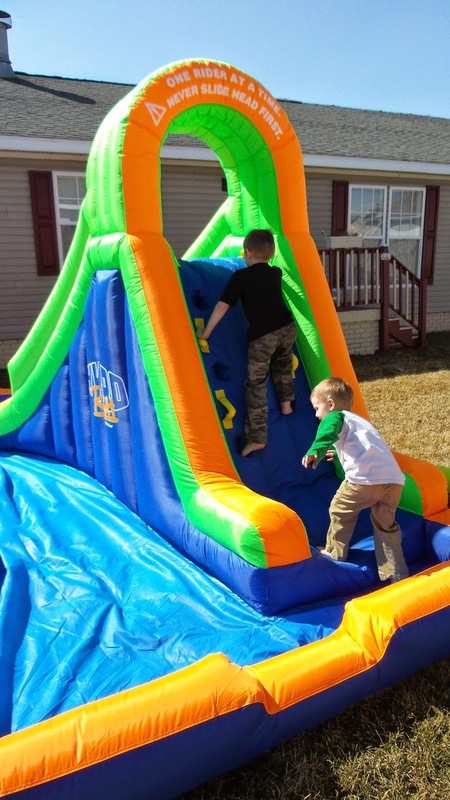 The kids are super pumped to share this with all of there friends and have it set up out back at our new house! I even think it's worthwhile for anyone needing a commercial moonwalk! I could not be happier with the product and company quality! This has been worth every penny and then some! Giveaway: Blast Zone is going to give one of A Lucky Ladybug's lucky readers a Magic Castle Bouncer of their own! 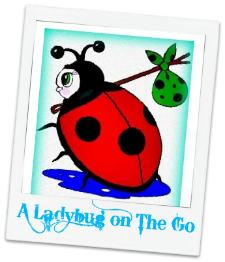 PLUS, A Lucky Ladybug has teamed up with 3 other bloggers to give you a total of FOUR chances to win one of these!!!! !